This De-Stash deal is working out really well! I'm clearing out a shelf and making some quilters happy at the same time. One of my favorite Idaho shops, The Quilt Barn in Kimberly, also did a de-stash on Instagram this month. I "won" two bundles of Civil War repro shirtings. For awhile it seemed I wasn't meant to have this fabric, what with PayPal problems and me thinking "pending" meant I'd paid the invoice and the shop hadn't received my payment. Finally, things worked out and I'll stash these goodies for the Marcus Fabrics Friends and Companions Sew-Along in August. Now that 2014 is half over, it's time to start thinking about Jelly Roll Party for 2015. Gudrun Erla taught a workshop at High Country Quilts this spring for the Piecing Partners Quilt Guild. I just happened to be in the shop the day of her class, and found this great new pattern for 2.5" strips. Just right to use my Kona Cotton strip roll! 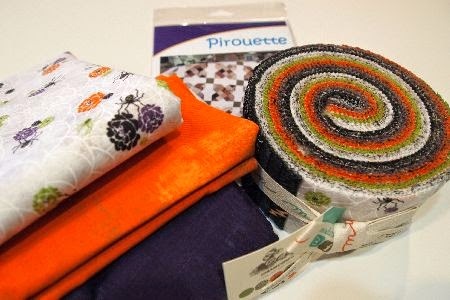 Speaking of Jelly Roll Party, how's this for the October sample? The fabric line is "Eerie" from Moda, and the background will be deep purple Grunge, with orange Grunge for the inner border. I read about this clever tip to de-fuzz jelly rolls on a blog a long time ago. 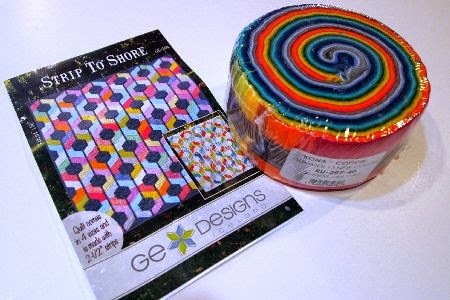 But I never remembered to try it, so I decided to give it a whirl while photographing this new jelly roll. Wow, look at all that lint -- and that's only from one side! Of course, it's very important to match the nail polish (Sandi Henderson for Soak) and FitBit bracelet to the fabric! The son of one of my best friends will be married in August at the Air Force Academy chapel. I've decided I should sew a new dress for the occasion. I'm thinking either a turquoise linen, or a bright, overblown floral. What do you think? And on a completely unrelated note, I just have to share this photo from last month's Front Range Modern Quilt Guild. 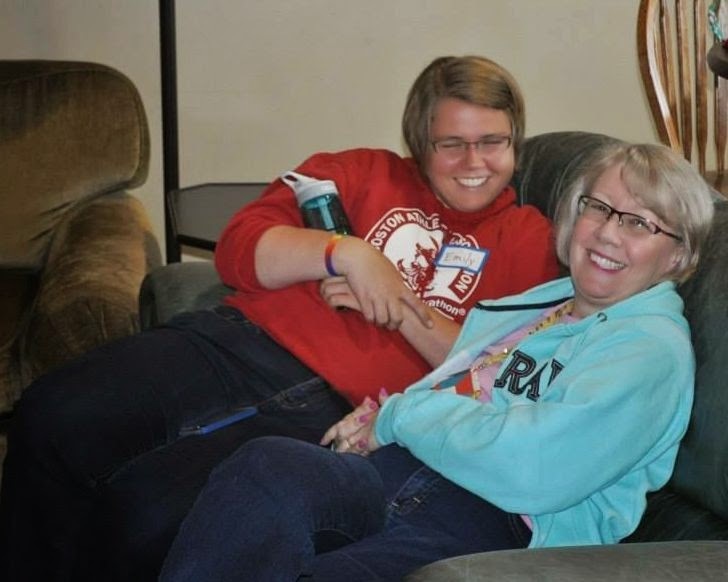 That's my friend, Emily and me, laughing at the photographer. She is so smart and so much fun, I wish I could just adopt her! 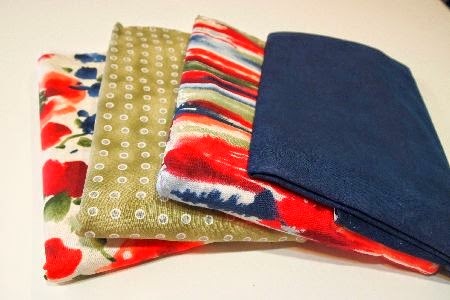 The blue is from Moda, 2 yards Solids for Moda. If you'd like to give this collection a good home, here's the deal: I'll give away the fabric, free. The recipient just has to pay postage. Anywhere in the world, just pre-pay the postage via PayPal, and the featured quilt kit is your! Just comment with your PayPal address and zip code. I'll respond with an invoice for the postage, and "April Showers" will be on its way to you! I'm going "camping" this week and don't know if I'll have internet. So if you don't hear from me, not to worry -- I'll be back by the end of the week! Gail, I'd be happy to send it to you for the cost of the postage. From your IP address, it looks like you might be in Australia? The postage would be about $28 US, or $12.35 within the US. Let me know if you want it! If Gail does not want it, I do. My zip code in KY is 41102. paypal jklmengland at windstream dot net Thanks! Elisa, in the upper left corner of the blog page is a search box (it has a little magnifying glass symbol in it). 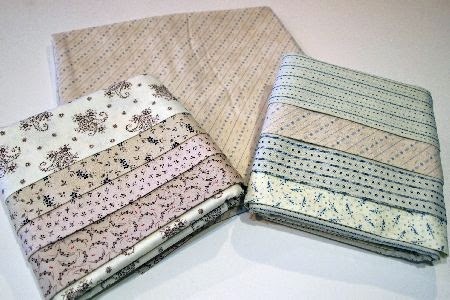 If you type in "jelly roll," you'll get all the posts I've written about jelly roll quilts. Jelly Roll Party is a group that meets at Ruth's Stitchery on the first Friday of every month to make a quilt using jelly rolls -- 2.5" strips of fabric. I have to get in line to get this fabric, if everyone else drops out. I love that grouping. It's colorful and yet subdued. I've got my fingers crossed! Aunt Marti, thank you for sharing, its so generous of you. I love the Dandelion Daydreams! Camping = Quilt camping I suspect!! !...Enjoy it...Great tip about the lint roller - those jelly rolls make such a mess. Love the colors. I can see using that floral as a focus fabric for some big blocks. I'm late to the commenters as I've spent the last week moving, oh well. If the material is still available, my paypal address is lyeager3@hotmail.com. I wasn't sure, so googled & they said it's your email address! Zip: 23320. PS I like the fabric/dress on the burda pattern in the first position.